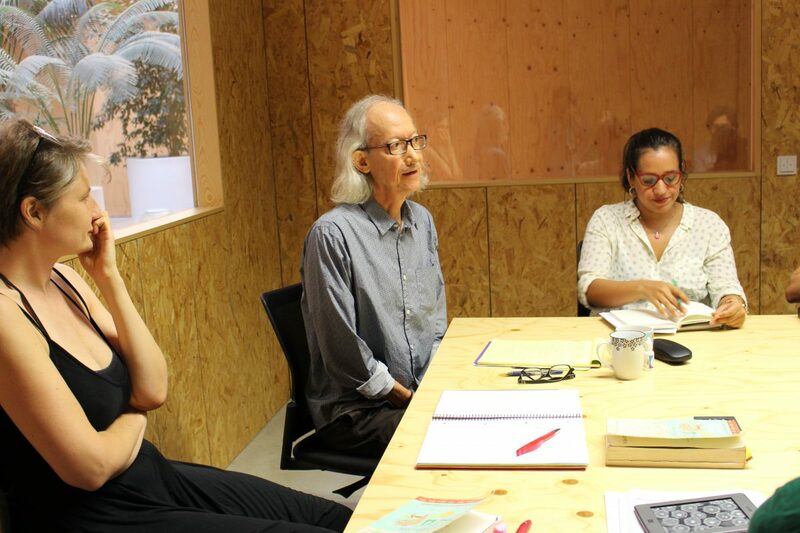 Workshops were recently held in Barcelona with Arturo Escobar to discuss two of his key texts. Isabella shares some important reflections on the social and political role of researchers, what it means to place oneself as an academic and how we, more broadly, understand and relate with the world. I felt very lucky to be part of the group of people who participated in the two workshops Arturo Escobar, the famed Colombian anthropologist, held at the Autonomous University of Barcelona’s (UAB) Institute of Environmental Science and Technology (ICTA) on 19 September and 3 October. In these workshops we discussed his two books, Territories of Difference: Place, movements, life, redes (2008) and Encountering Development: The Making and Unmaking of the Third World (1995). In this post I will give a brief overview of each book and then share the reflections and key points of discussion that emerged in our workshop. Workshop with Arturo Escobar in Barcelona. Photo credit: Isabel Lopera. Territories of Difference offers an impressive account of how it is possible to think complex relations and realities from the perspective of specific places, understood as “co-productions between people and the environment” (p. 42). The author takes as an exemplary illustration of this perspective the Colombian Pacific region. In the words of political geographer Ulrich Oslender, the Colombian Pacific is an “aquatic space”, in the sense that aquatic environments are of continued importance for many local groups. This is an example of how places can be seen as socio-natural co-productions. This complexity of relations, the book reveals, can be captured through the notions of place, capital, nature, development, identity and network. Each of these notions are elaborated in a chapter of the book. Arturo Escobar insists on a perspective ‘from below’, which emphasises “subalternity” and “difference”. He describes “politics of place” as subaltern practices of difference that intend to create alternative socio-natural worlds. They reveal discourses of desire and possibility and provide us with an apt imaginary for thinking about the ‘problem-space’ defined by global coloniality. The same perspective ‘from below’ motivates Encountering Development. In this book, the author focuses on how discourse is produced under conditions of unequal power. Such power disparities stem from colonial history and persist within colonialist understandings and practices. Power works in discourse through “the yardstick by which to encode and represent cultural Others”. This is what postcolonial scholar Chandra T. Mohanty has termed ‘the colonialist move‘. A perspective ‘from below’ turns around previous narratives, in which the allegedly objective observer actually ‘enframed’ reality in a very colonialist manner. That is, the observer framed reality according to European categories, claiming to be detached and objective, while actually being immersed in local life. Thereby, subjectivity and particularity were masked as objectivity, fixing global coloniality and unequal power relations. The author deconstructs discourses of modernity and development and contrasts them with Other, existing or to-be-imagined ways. He does so by telling four tales: the Tale of Three Worlds and Development, Tales of Growth and Capital, Tales of Food and Hunger and Tales of Peasants, Women and the Environment. He concludes then with reflections on Imagining a Postdevelopment Era. One of the issues with far reaching academic, political and social repercussions that the book raises is the modern “separation of social life into functional spheres” (p. 60). As one quintessential aspect of modernity, each of this spheres—the economy, the polity, society, culture, nature and the like—is attributed laws on its own. Academic disciplines such as political economy and political ecology partially try to overcome this separation, amidst a more general relational shift in science (observable also in disciplines such as physics or biology). Arturo Escobar’s plea is to reconnect these fragmented parts in social and political life as well as in academic reflection. The discussion in our reading group focused on one phenomenon that illustrates the separation of economic and socio-political spheres and shows the necessity of their re-connection. The way places are produced by capital stems from a separation of an abstract sphere of economics that can exert power over places. Demands for strengthening local economic forms that are embedded in these places’ social and political relations, in turn, imply a re-connection of economic, social and political spheres. Our critical discussion has shown that this particular phenomenon has the potential, and necessity, to be further developed through constituting an open research field. Our reading groups agreed that academics and researchers are interrelated with their social and political environments. Therefore, it would be recommendable that they are aware about their relations with and influence on such environments (and vice versa). Three ways to interrelate with the social and political environment were suggested by Arturo Escobar in our discussion. First, it is possible to do mere academic work; second, we can bring academic and activist work into dialogue, which would correspond to what has been called ‘investigación y acción colectiva‘ (‘collective action research’); third, it is possible to adopt Other (for instance, local) categories and try to displace academic-modernist categories. Placing oneself as an academic, moreover, relates to profound ontological and epistemological issues. Argentinian-Canadian anthropologist Mario Blaser elaborates on them. Focusing on how different worlds come into being leads us to ask question such as: what kinds of worlds are enacted through what kinds of practices? What (power-driven) negotiations occur among and across worlds? Ontology refers to assumptions, practices through which premises are performed, and narratives that people tell themselves, leading to different “onto-epistemic formations”. Relational ontology, finally—as adopted in Buddhist thought for over 2000 years—reveals not only how things are related, but also how things are mutually constituted. When it comes to socio-natural formations or society-nature relations, relational ontology can imply shifting viewpoint. Specifically, according to Arturo Escobar’s explanation, this refers to the natural environment understood as part of a ‘pluriverse’ of political ecologies. A mountain, for example, is often considered as a bundle of inert rocks, whereas an ecologist positioning considers it a site of socio-natural interactions. A relational ontologist’s position goes further: it takes it literally that mountains are alive. * Isabella M. Radhuber is a Postdoctoral researcher at the Institute of Environmental Science and Technology (ICTA) at the Autonomous University of Barcelona (UAB), Marie Curie Fellow by the Austrian Science Fund.